Verco's volute Notovoluta verconis, copyright Aegean Shells. Contains: Nassariidae, Columbellidae, Fasciolariidae, Melongenidae, Colubrariidae, Buccinidae, Turbinellidae, Pisaniinae, Pyrifusoidea, Volutomitridae, Costellariidae, Muricidae, Coralliophilidae, Mitridae, Marginellidae, Olividae, Olivella, Fulgorariinae, Voluta, Lyriini, Scaphella, Amoria, Alcithoe, Odontocymbiolini. The Muricoidea, used here in the broad sense as in Simone (2011), comprises the rhachiglossate neogastropods, a group of neogastropods characterised by the loss of the marginal teeth on the radula, and usually the presence of the valve of Leiblein, a pyriform bulge in the esophagus just anterior to the nerve ring containing a ciliary valve in the anterior third followed by a thick glandular chamber (Simone 2011). Families of Muricoidea include the Volutidae, volutes, which have often strikingly-marked shells with an elongate aperture bearing deep plaits on the inner lip. [LB89] Leal, J. H., & P. Bouchet. 1989. 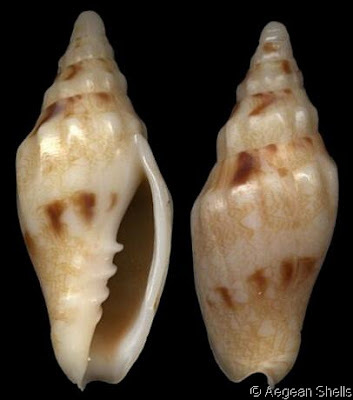 New deep-water Volutidae from off southeastern Brazil (Mollusca: Gastropoda). Nautilus 103 (1): 1–12. [L06] Luzzatto, D. C. 2006. The biology and ecology of the giant free egg capsules of Adelomelon brasiliana Lamarck, 1811 (Gastropoda: Volutidae). Malacologia 49 (1): 107–119.